One of the largest garbage and recycling collectors in the country had a curious message just ahead of Earth Day. I don’t feel like this audience needs this fact check, but I want to be absolutely clear — bags given to you at the grocery store can absolutely be recycled. Here’s a list of just stores that take bags back (thanks to Kendra Martin for the link). In fact, the company that won the most recent Plastics News Processor of the Year award recycles bags. We have video of Petoskey Plastics sorting bags and everything. There were a chorus of people pointing out Republic Services’ error (including myself). Perhaps the company’s curbside collection doesn’t take plastic bags, but there are takeback locations throughout the country. In Michigan where I live, grocery chain Meijer has a bin right when you walk in to drop off clean, used bags. I take back our bags every month or so. 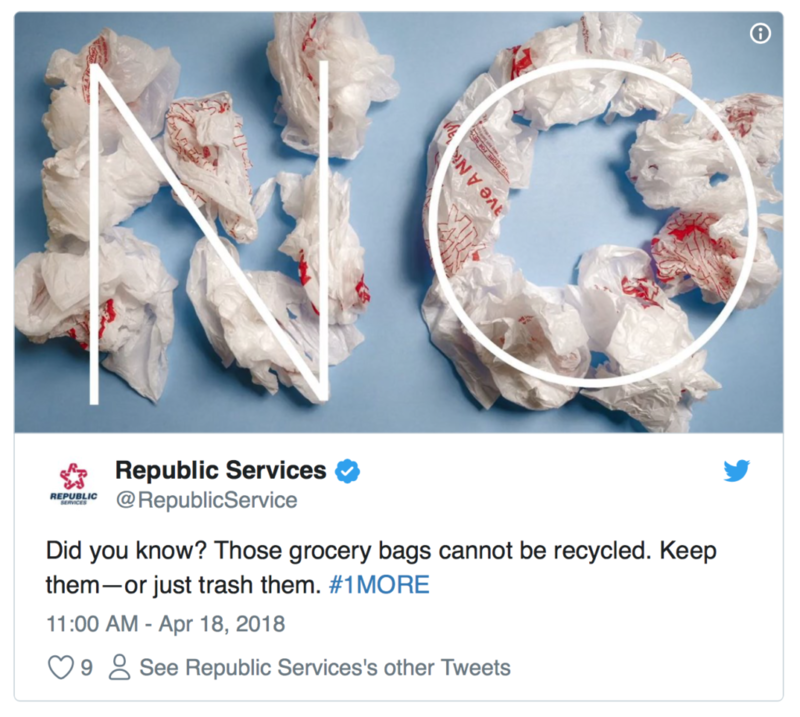 The company responded several hours later agreeing with the masses — yes, bags can be recycled but not through its curbside collection. But the original message that wasn’t true is still posted on its verified account. And not everyone pointed out Republic Services’ error. There were several people who liked the tweet, including a sitting assembly member from California and an anti-litter group from Arizona. Both of whom should know the truth. Plastic bags have been much maligned, and those that live near waterways have fought pretty successfully to ban them. Regardless if you think they should be banned, everyone should be encouraging those who use bags to recycle them, not just throw them in the trash. That’s the message we should all carry into Earth Day.